Ss will do two exercises to practice the modal verb can. 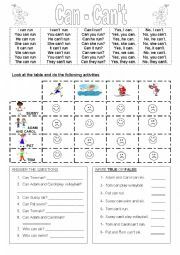 I`ve prepared this worksheet to practice listening skills and simple past tense. Key is included. I love Elvis´music so I think that you enjoy it!! Hugs!! Students will write a daily routine in the third person singular. Then, students will imagine they are on holidays and write an e-mail to a friend. 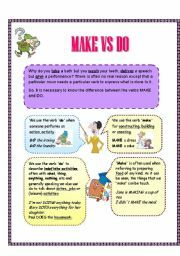 It contains a grammar guide that explains the difference between the verbs MAKE and DO. 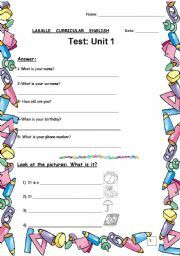 It also contains usefuls expressions, exercises to fill in the gaps and the answer key on page 4. I hope you find it useful!!! Hugs!! Simple exercises to practice the verb To Have: affirmative and negative sentences; short and long forms. I hope you like it! 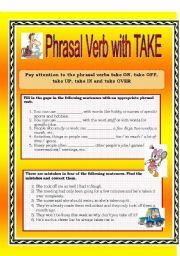 This worksheet has 2 exercises that deals with the phrasal verbs take in, take off, take over adn take up. I hope you find it useful! 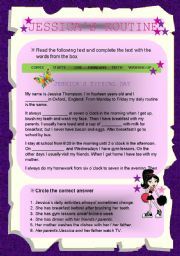 This ws is perfect to practice SImple present tense and present perfect tense. 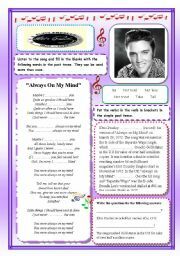 And as I have already mentioned: Elvis`songs are perfect to teach tenses!Hugs!!! 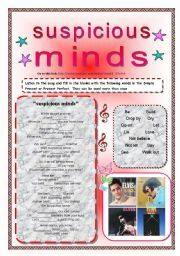 Description: Students read the text and complete it with some words that are in a box. 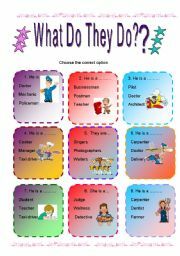 Then they have to choose the correct option of some sentences related to the routine. I hope you like it. Thanks to Mena for her template. Content: 1º) personal questions; 2º) what is it...? 3º)Put the months in order; 4º)Write the days of the week; 5º)Where is the book? (prepositions of place); 6º) what time is it?. Hope you find it useful. You have to choose the correct option taking into account the pictures. I hope you find it useful! !